Danish Walia: Did you ever want to go far away ? Where would you go? Never imagined you would go into a coma did you? 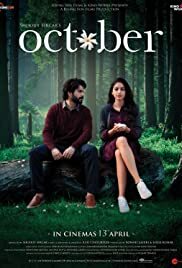 Other people give up on you easily and you fight for survival constantly... this movie portrays in a subtle way.. how fragile this life is .. yet how powerful simplicity of thought is..... Varun's character paints simplicity of thinking in this complex world..... The director extended emotion in various scenes... some as simple as thinking blankly about today from the window of a hospital... without getting weary about tomorrow's survival.... alson it paints a picture where Smell of shiuli flower can sometimes bring life in a still body... shiuli flower does bring back my childhood memory too. Loved collecting those in the morning... sometime I helped my mom with those to make flower garland ready to offer to the Gods & Goddesses. Coming back to the movie... it stretched a bit sometimes.. so you may feel bored through the mid way, but do wait till the last scene..... if you have ever felt the pain a of a young lady fighting for her survival... this movie will surely leave you heavy hearted and with a sense of more humility towards life.